This entry was posted in Gardening and tagged california native plants, cats in the garden, garden humor, garden humour, smile quotes. Bookmark the permalink. Thanks for the smiles Alys! 🙂 🙂 Those snails are probably smiling too… same here! As soon as the ground dampens they are out and about nibbling. Shame they don’t seem to like the weeds! I’m glad you smiled, Cathy. 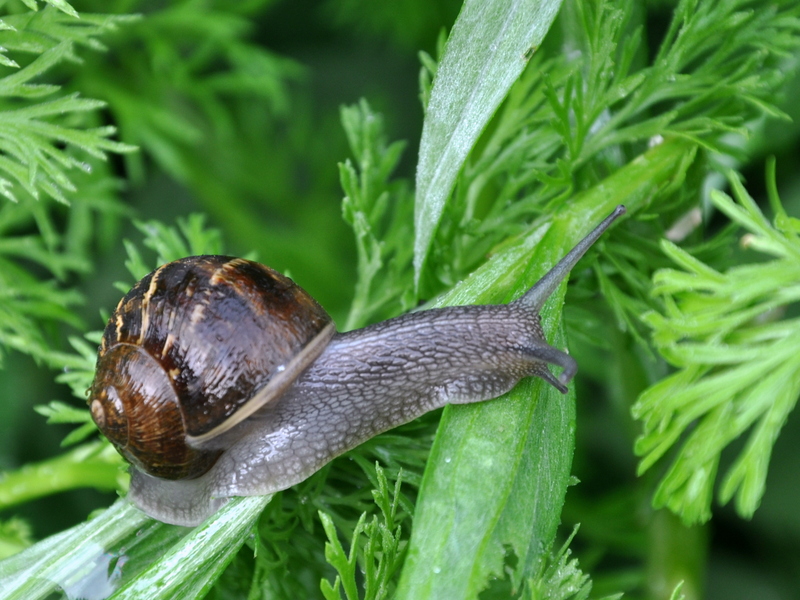 🙂 It would be lovely if snails enjoyed the weeds. One of those win-win scenarios. Apparently snails are tasty to opossums, but clearly they’ve had their fill, leaving plenty behind. How ironic that I’m having the same struggle with ‘our’, but I’m sticking to my Canadian roots! 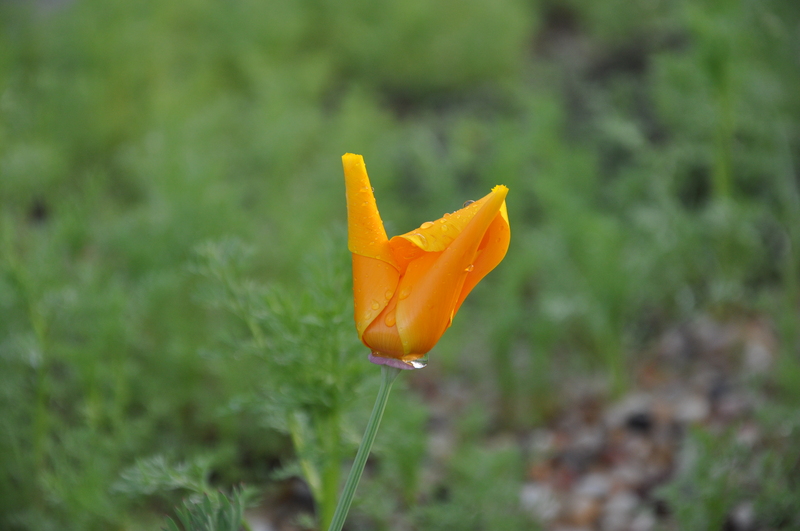 Love the California poppy – never would’ve guess what that was! Hurrah for Canadian roots. We go with what we know. I don’t think *I* would have guesses that was a California poppy if I hadn’t seen it up close. Funny that I don’t remember this from prior years. Perhaps it’s all in the perspective. Snicker and giggle!! When it comes to spelling I think we understand each others differences enough not to be bothered – well, I’m not bothered anyway 🙂 I think one of the wonderful things about blogging [and there are, as you know, so many wonderful things about blogging] is that we learn about all the different ways we use language. We learn that a word has one meaning for me and another for you [‘rubber’ springs to mind], that we call the same thing by different names, like car trunk or boot. The use or loss of a ‘u’ simply places us in or out of the US. I’m pretty sure that eventually American English will rule the day, simply because the auto corrects on all our platforms are US spelling by default and so many young people seem to not care about good language any more. Innit so bro? Isn’t it amazing to see how the old flowers spring back to life with a little rain – will you give the sweet peas something to climb up or just let them tumble about at will? Mine weren’t so good this past summer on account of the amount of wind they got – that side of the house took the brunt of it. 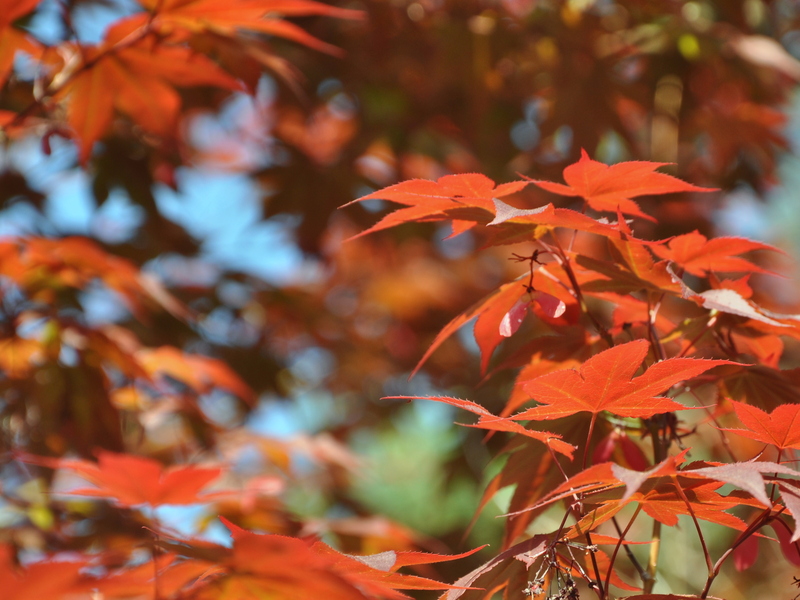 Why is you Maple red in Spring? Is it a supposed to be red in Spring? All the maples I know are red in Autumn [another language difference]. Is this a Special Maple? An Aberrant Maple? A Confused Maple? It’s very intriguing! Innit so bro? You crack me up, Pauline. I hadn’t even thought about the American technology on smart phones. They should have a “Queen’s English” setting. Thanks for understanding my dilemma. So in my defense, I was concentrating on taking a photo of a newly moved trellis and the lovely vine and just didn’t see Mouse at my feet. He’s always nearby when I garden, so I some how focused upwards, but caught him in this funny picture just the same. 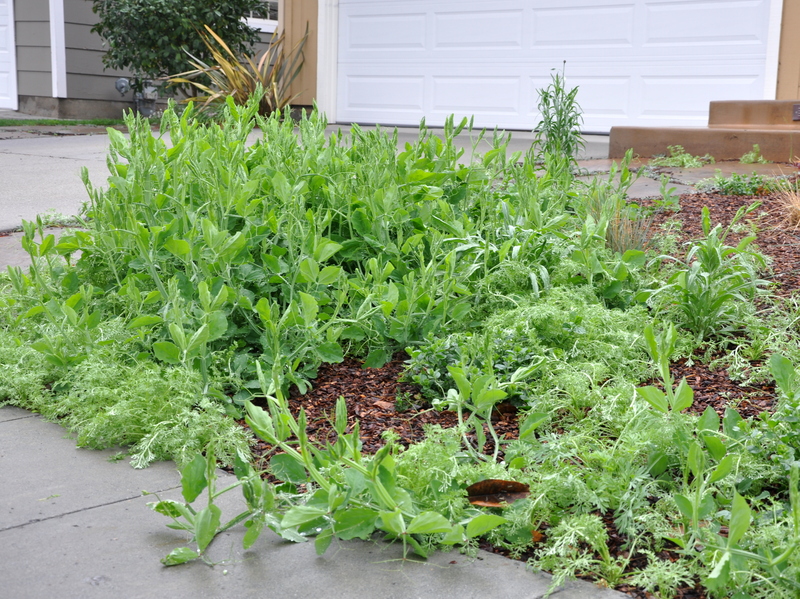 I’m sorry to hear about the fierce winds punishing your sweet peas this past summer. Your weather has been just as off-kilter as ours has. I did put a trellis down the center and it’s nearly covered in just a few weeks. A few are single plants so they’ll just wander across the ground at will. Now that the nigella are establishing and gaining height, all the plants are intertwining and supporting each other. As for the autumn colored maple (this one is an Acer) it usually goes red, then green. This bright orange didn’t last, but it was so pronounced while it did. Last year was so dry that the autumn leaves never dropped. They turned to brown and hung on to the tree. I don’t know if that made the difference, or maybe I’m not even remembering properly year to year. It made me smile none-the-less. I love your smile quote and heartily agree. 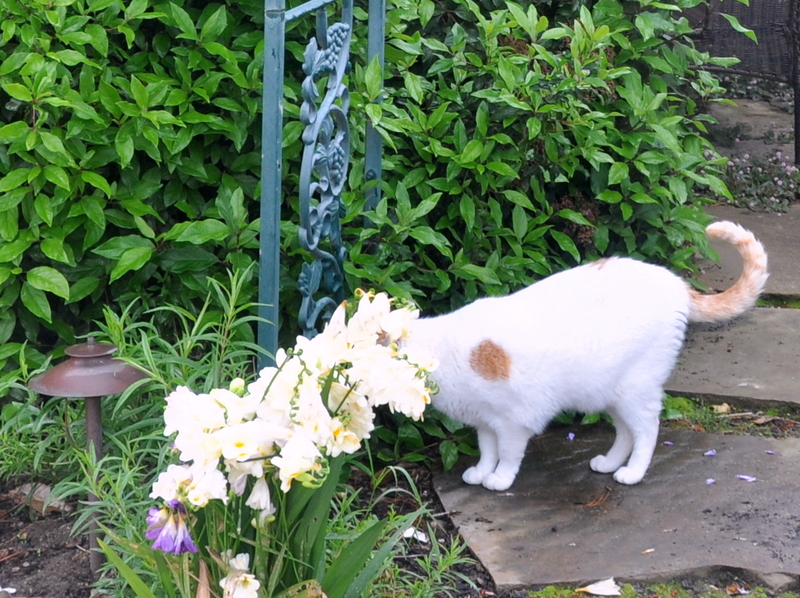 Loved the California poppy – aka alien, but the cat’s tongue really did make me smile. Beautiful pictures! Thank you! That little tongue poking out between the grass is pretty smile-worthy. The best laid plans! 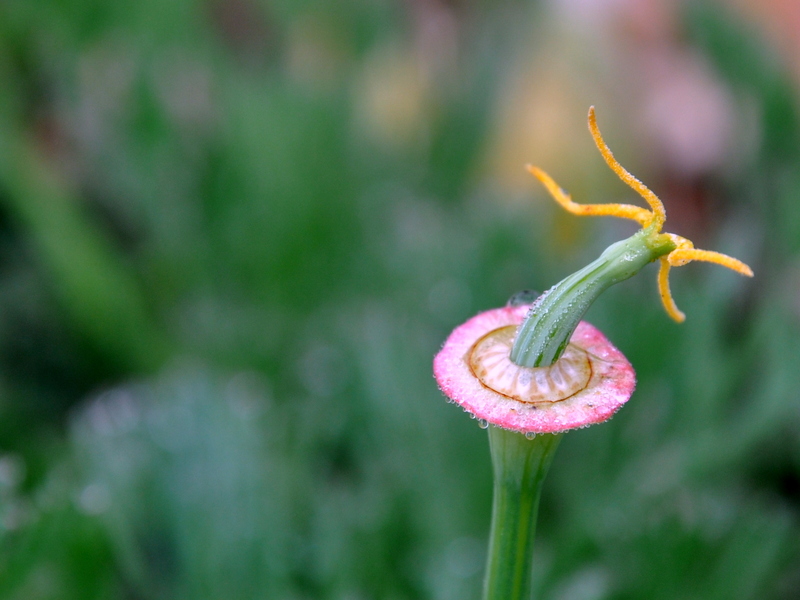 Your garden, in its recent growth, has a seriously perverse sense of humor! It’s so, so GREEN and VERDANT now! I love the photo of the Snicker snack . . .
I’m glad you smiled at the snicker snack. I haven’t heard that term in a few years. It’s one of my favorites. It’s amazing how green and verdant it is. And we got more rain last weekend, so my tanks are full once again and the garden continues it’s growth trajectory. It is such a pleasure. I love this little patch of self-seeded jungle and enjoy it every day. I pull small weeds around it, clip flowers, tuck things back from the sidewalk and marvel at the wonder and beauty of it all. All of the nigella are setting buds now, so I’ll have another wonderful batch of purple flowers any day now. 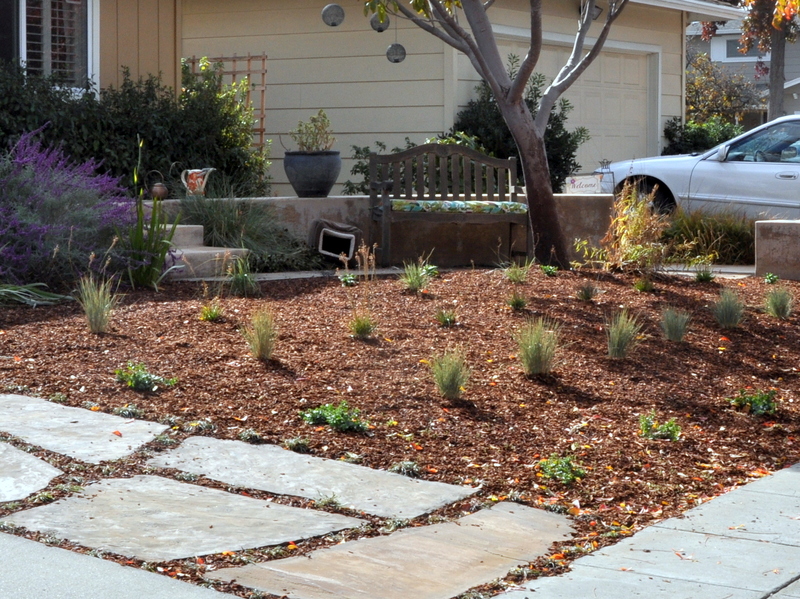 Did you finally get a break in your rain so that you can put in a garden? We had rain over the weekend, a few days break, with more rain promised by Wednesday. I’m loving it! Oh a new gate. How exciting. I hope it’s because you wanted one and not because the other gate came down in a storm. It’s unexpectedly cooler here this week with a bit of rain in the forecast, before the warming trend begins this Saturday. By early May we are often into three day heat waves. I hope this rain lasts a little longer. I’ll keep my fingers crossed for you. The little gate that was here when I moved in was rotted. I was going to paint it as I was ordered to but it was in such bad shape we took it down and TS has put up a substantial one for more privacy. Photos will come soon. Nothing goes as easy as one would like. Your HOA is quite bossy, eh? I’m glad you’ll have a nicer gate in the end. We need to have ours replaced, but it keeps moving to the bottom of the list. It won’t stay latched, the squirrels have gnawed through the lattice and it rattles when you close it. I look forward to your post. Hang in there. Sherri, you inspire me. I think you’re amazing. Thanks for popping in so you could admire the Canadian sweet peas. Isn’t that a hoot? This did make me smile! You know, I’ve heard that the desert breaks into bloom when it rains, whether in Arizona or Egypt or California. It will be fine. Remember to cut those sweet peas for the house and they will keep blooming! Lisa, I’m glad you smiled. A friend recently returned from the SoCal dessert after a super bloom. I saw a bit of footage of it as well. It happens about once a decade after a big rain. I would have loved to have seen that in person. I never thought to equate my cottage jungle with a super bloom, but now that you’ve pointed it out, it does make sense. Thanks for the reminder to keep cutting the flowers. I put together three small vases over the weekend, and I’m taking some cut flowers to Pilates on Thursday as well. I wish I could hand some off to you, too. Thank you, Sheila. It’s been a wonderful surprise. As the contented craft said above, I think spelling differences are easily understood. Sometimes word differences cause a bit of confusion but as a linguist I find it really interesting to see language divergence – and at the same time I’m amazed by the similarity in things that I thought might have been different. 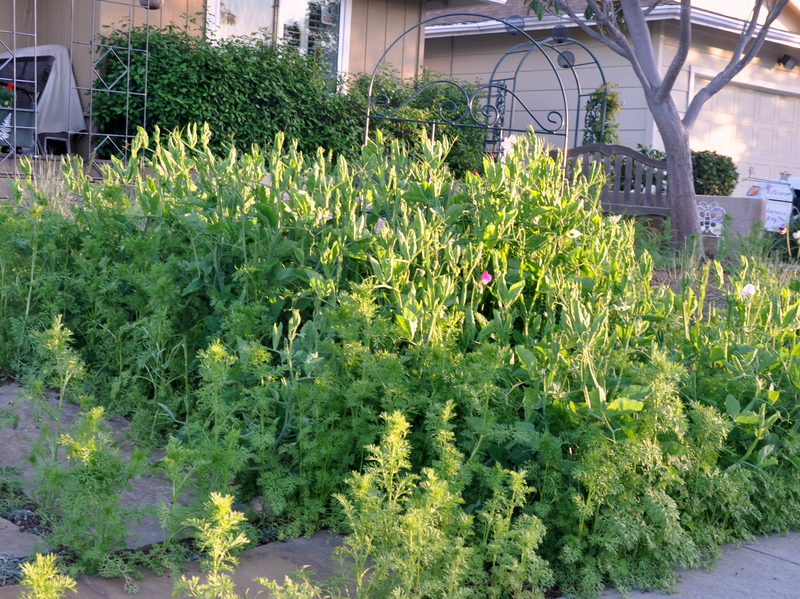 Anyway, the native Californian plants might be held back a little but I’m sure they will shine once the sweet peas and such have had their day. Helen, I didn’t know you were a linguist. How fascinating. It’s intriguing how the world came to have so many languages, and how some are based on certain patterns, like romance languages or Germanic languages, yet remain distinct. Accents, too. I think you’re probably right about the covered natives. Once California’s heat waves set in, the flowers will quickly die back. I just hope that it’s later this year than in the past. It’s mid-April now, so we have about two to four more weeks of cooler weather. Only two-four more weeks of cool weather…. Sounds wonderful. This spring is turning out to be a bit on the cool side, so some heat would be nice. I like the way you see the world! Thanks for sharing! Thank you, Linda! I’m sorry it took me so long to get back to your happy comments. You’ve proved that you’re still Canadian (smile)…. almost saying ‘sorry’ for your spelling! But it’s part of the great diversity of blogging, isn’t it? These are wonderful photos and yes, they make me smile. Thank you! Blogging is wonderful. My world has expanded in a thousand wonderful ways. Awesome photo’s eh? Maybe back in the 60’s, Californians might have thought that YOU were the alien, being a Canuck landing in America. I wonder if you had an Canadian accent? I don’t notice much of an American one, but a little bit. Do I have an accent? Pauline and of course Julia sure do. Laurie maybe a little bit, especially when she’d say, “what now?” But to me, you have the least discernible accent. So I wonder if that’s because you’re a transplanted Canadian? 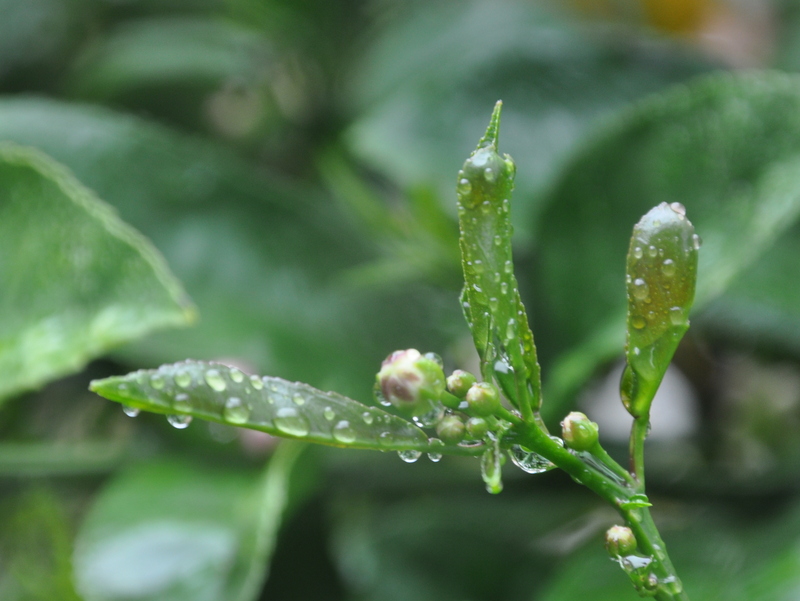 I digress…..
All those pic’s are cute but that saucy lemon tree made me laugh the hardest. I might not have noticed that, LOLOLOL too funny. I wonder if Mouse realizes how utterly charming he appears with so little effort, that guy is adorable. My sister asked to borrow a “rubber” in school and was laughed at, of course, and so it goes. I’m sure my accent changed since I was so young when we go here. People used to ask me if my dad had an accent since he was British. To me he just sounded like my dad. Funny what we hear and don’t hear. I notice a few pronunciations different from ours, but for the most part I don’t detect an accent. You say aqua differently, whereas here we have a large Latin influence so say it ah-kwa. And now that I’m hanging out with you more and more, I’ve resumed the use of “eh”, eh! I’m glad you giggled at the saucy lemon tree. Honestly, I can’t take that citrus anywhere. Such an embarrassment. [snicker] As for Mouse….what can I say? I *love* your quote: t’s pretty amazing that after that corner of the garden was dug up, preened and teased then coated in mulch that these sweet peas would grow. Shows their tenacity and mother natures veracity. If humans disappeared tomorrow, Earth might be a jungle pretty quickly. Pardon me? A rubber? sigh, poor Sharon. Gah! Thankfully, there’s always enough of us outsiders to make a happy little group of cool kids. HA! I bet some kids probably secretly thought of you as, ‘the exotic red head from far away lands’. 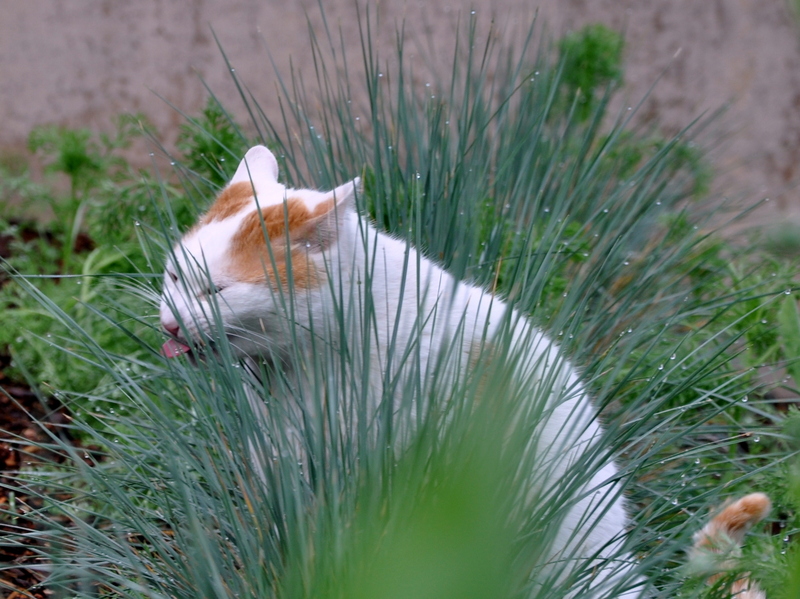 Such sweet pictures of your Mousie chewing grass. haha And his flower cap. 🙂 How strange to have orange leaves in the spring. Our (sycamore?) tree’s leaves turns orange and fall off in July/August. It’s so bizarre. Mouse is a character. He keeps us entertained with his antics. I’m fascinated to hear that your sycamore tree turns orange in July. What an unusual tree. Is it entering dormancy at that time or is it a transition color?